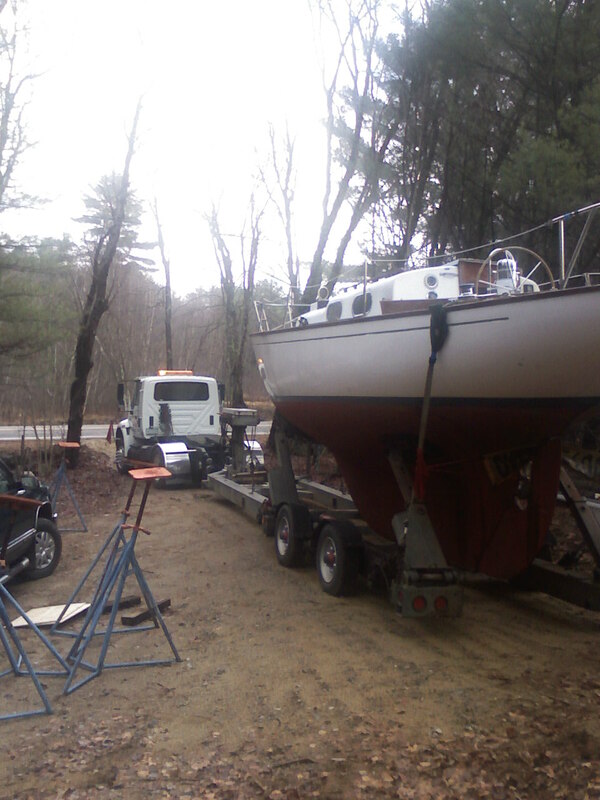 When I originally had the boat hauled to my house in November 2008, I knew I didn't have much time to get some sort of shelter over it before bad weather would make a mess of my already neglected boat. I opted to build a canopy to keep the weather off Magic as best I could. It was very basic with a shrink wrap roof. Unfortunately I didn't have enough pitch and I needed rake the snow off the roof whenever anything over 2 inches fell (this happens alot in central NH). It didn't take long before the canopy started sagging and some of the roof strapping snapped on several occasions when I didn't get out to knock the snow off in time (usually when we had an overnight snow). Needless to say the canopy did not hold up well and barely made it through the winter. I had hoped to get started on the recore project this past summer (2009), but life got in the way and the boat sat without me doing much of anything to it. By late this summer, I finally found some time to start thinking about getting something done on the boat, but knew it would be imperative to get a real shelter over it so I could get work done over the winter months. I spent a good amount of time researching possible solutions and found that my options were limited given my budget (<$2000) and not wanting to have to permit the structure. I considered a Shelter King, but for the size I wanted, the budget would be pushed to the limit. I don't remember how I originally found Stimson shed, but I found a website (www.ramoak.com) where a guy (I think his name is Chris) gave a great narrative and pictures of the Stimson he built. After researching every angle I could find regarding the Stimson, I went ahead and ordered the plans from Stimson Marine. I have to say that these plans were fantastic. The booklet that accompanies them gave all the details I needed to easily construct all the bows for the shed. Basically you decide how wide you want the shed (length doesn't matter, you just make more bows) and then build the form according to a table of offsets in the booklet. Another nice thing about building the form is that once you finish the form, your first bow is complete. Then it is just a matter of going to the local lumberyard and picking the best 1x3 strapping (you get good at picking that out or you will snap a lot of them). My shed dimensions were 14' x 37.5' and I built the form on my basement floor using a single sheet of cheap plywood and a few 2x3's. All told I made 26 bows (each bow is 1/2 the roof span) to make 13 full bows center just under 3 feet apart. One issue I needed to contend with was to make sure I had enough width high up since the boat deck (and widest part) was about 10 feet off the ground. Since the bows arc inward to the ridge, I need to build a 4 foot kneewall to accomodate the boat height. To do this I sunk 12 pressure treated 2x4x8 foot posts 3 feet into the ground and cut them off to a level 4 foot height. I then added a 'sill' along the perimeter of the posts to give the bows a place to sit. So once the kneewall was complete and all the bows were built it was time to put it all together. This was the part I worried about the most and as it turns out, there wasn't much to worry about. I assembled the bows by measuring the spacing on a 2x4x10 (just under 3 feet) and then screwing them to the ridge 2x4. At this point, I enlisted the help of my wife and son to help steady things while we hoisted the assembly up onto the sill and then had my son hand up a bow on the opposite side which I screwed to the ridge 2x4. I did the same thing to the other end so we had 4 bows on one side of the ridge and 2 on either end of the other side. This is not so easy to describe but very easy to actually do. Unfortunately, it does take all your available hands and I didn't take any pictures, but below is a picture of the first 'assembly' before it was hoisted up onto the kneewall. For the rest of the bows I did the same thing and completed it all with 3- 4 bow assemblies and 1- 2 bow assembly. All told it took about 6 hours to get everything up, but it was very satisfying to see the frames all up (I think they look pretty slick). Then came the tedious task of bolting all the frames to longitudinal stringers and adding a few diagonals to stiffen things up (I don't live in a windy area or I would have added more). The last carpentry bit for the construction phase was to add endwalls. I pretty much cobbled those together with existing wood I had and framed in a doorway and openings for vents. The final step was to put the cover on. I ordered a roll of 32x100 7 mil white shrink wrap and started with the ends, making sure to overlap onto the top of the shed. I held them in place with temporary battens and then pulled the main cover in place and battened it down on the gable ends and along the bottom (I ripped a few 2x6s' into 3/8" battens). I rolled the battens up in the ends of the shrink wrap and screwed everything down and then covered the battens with 6" shrink wrap 'preservation' tape. Preservation tape seems to be a fancy word for UV protection. After some recommendations from other who had built Stimsons before, I added big 2x2 gable end vents to reduce condensation on the inside. I don't have any pictures of that but here are a few below. The final tally for the whole project was about $750 and 50 hours of my time. I am really happy with the finished product and I think it will serve me well for the duration of the restoration.